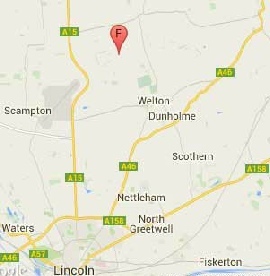 FORGE ARTS was established in 2005 as a picture framing workshop and art gallery situated in the picturesque rural Lincolnshire village of Hackthorn, just 6 miles north of the city of Lincoln. FORGE ARTS Gallery and Studio is situated in the former Victorian village joiner’s workshop and retains many of it’s original features. In 2017 the interior of the gallery was remodelled to create more exhibition space and allow it to expand and develop its unique character further. 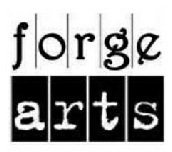 FORGE ARTS exhibits and sells the work of local artists and craftspeople and offers superb original artwork and quality bespoke picture framing. 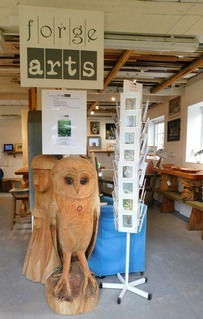 We are the main outlet for the work of celebrated chainsaw artist and sculptor, Mick Burns and stock a range of his garden carvings including his popular perching owls. We are also the main supplier of paintings and prints from talented local artist Mike Finney whose studio is situated in the gallery. FORGE ARTS also houses the studio of crafter, Sally Dodson who works mainly in paper and fabric. There is always a range of Sally’s fabric and paper floral designs available at the gallery. 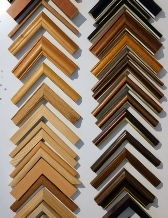 FORGE ARTS also have a fully equipped picture framer’s workshop which is well stocked with a range of mouldings and mounts. We are able to supply frames for photographs, certificates etc. as well as producing bespoke frames for artwork. ‘Have you ever thought what it is that stops people walking into galleries, even if they love art? Is it the atmosphere, the attitude of gallery staff? Perhaps they feel intimidated, threatened or just frightened that they may have to spend money once inside.